Fab moves an AKGC12 around until the drum set sounds good with just one microphone. Chapters: -Multiple mic positions -Multiple gobo positions -Multiple drum positions -Focused comparisons between positions -Microphone comparisons -Compression with UAD Fairchild670 The attached zip file contains the audio examples of every position in every acoustically modified environment. 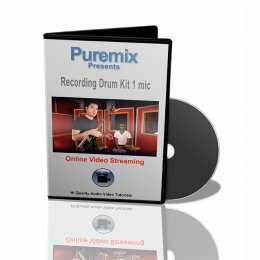 Please download the files and use it to form your taste, experiment and help you choose where you will set your microphone and your drum set in your room. Featuring the AKGC12 Mike and UAD Fairchild670 compressor plug-in.